Securities and Exchange Commission in US has filed a civil suit against Goldman Sachs accusing of securities fraud on Friday. World stock markets dropped considerably after this news. How is this going to affect Indian Stock Markets? On Friday,it was reported that Goldman Sachs was sued by SEC, with the US market regulator alleging that Goldman had created and sold a complex investment product related to housing finance that was secretly devised to fail. The news of the suit pulled down Goldman and other financial services stocks,which in turn affected the Dow Jones Index also. the Dow Jones industrial average was down 125.90 points (1.13%), at 11,018.66, while the Standard & Poor's 500 Index was down 19.54 points, (1.61%), at 1,192.13. The Nasdaq Composite Index was down 34.43 points,or 1.37%, at 2481.26. How much could this affect Indian Stock Markets? The sensex had rallied over 10% to above 18000 after budget in February 2010, but this week it has lost nearly 350 points to close at 17,591 on Friday. The stock brokers expect some profit taking on Monday. I believe it could be in tunes of 1 - 1.5% which translates into 170 - 200 points correction. Stock market research analysts also feel the stocks of companies in which Goldman Sachs holds stake, could witness heightened selling on Monday. According to data collated by Bloomberg, the top five holdings for Goldman Sachs Invest Mauritius were LIC Housing Finance, Lanco Infra, CESC, United Phosphorus and Educomp Solutions. 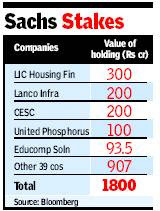 Goldman Sachs' total investments in Indian stocks could be worth more than Rs 2,000 crore.